Asparagus Mimosa, Thyme for Cooking easy seasonal gourmet first course. Snap off ends of asparagus. If white use vegetable peeler and peel bottom half of stalk, laying it flat on the counter so as not to break it. Put asparagus in a skillet with a 1/2" (1.25cm) of water. Put over medium-high heat and simmer until just barely tender when pierced with a sharp knife, 5 - 10 minutes depending on thickness. Remove and rinse lightly in cold water to stop cooking / set color. Peel eggs and separate yolk from white. Finely chop white and yolk separately. Mash yolk with a fork to get very fine. In a small bowl mix mayonnaise, mustard and vinegar. Lay asparagus out nicely on small plates. 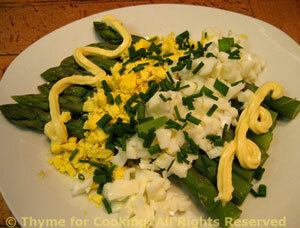 Make a row of egg yolk just behind the tips of the asparagus, dividing evenly. Make a row of the egg whites just behind the yolk. Spoon the mayonnaise behind the egg whites. Sprinkle the chives over all and serve.